I must admit that I have only just obtained an appreciation for illustrations and artwork. In my younger years, I was too much of a 'power gamer' too focused on numbers and probabilities to fully appreciate the flavour and artwork. In some combats, I did not even care about the name of the beast I was fighting, I just wanted to see its stats. Art was always there, and I always acknowledged it; I just didn't really care for it. 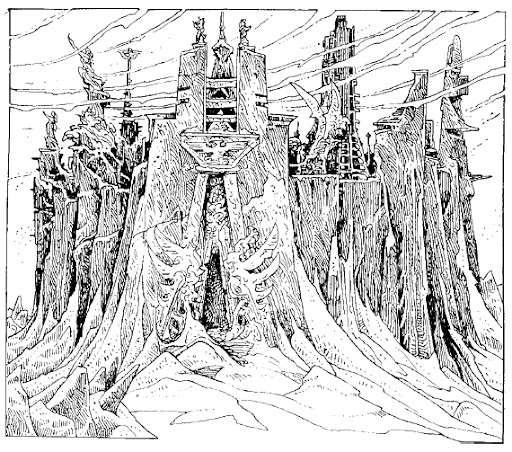 However, as I have started to include public domain artwork in my gamebooks and I have started reading about the creative process that artists go through, I have started to discover that the role of the illustrator is crucial to the atmosphere in a gamebook. 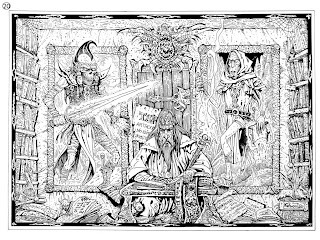 Someone who has known this for far longer than I is Russ Nicholson excellent illustrator of many gamebooks and RPGs including (but not limited to) The Warlock of Firetop Mountain, the Fabled Lands series, the Robin of Sherwood gamebooks and the Kingdom of Wyrd (Bloodsword). Biographies of Russ can be found here and here. You can visit his blog here. Today, it is my privilege to introduce an interview with Russ Nicholson. What was the first gamebook you read? 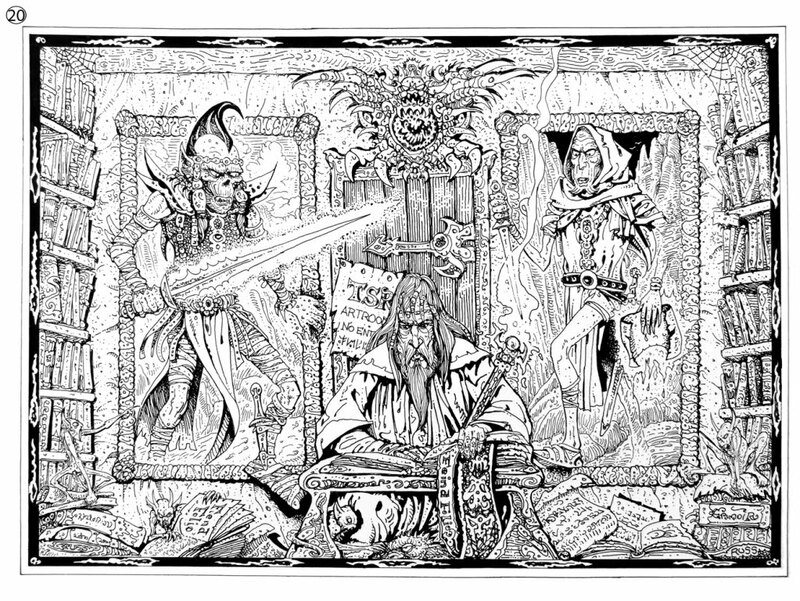 That would be 'The Warlock of Firetop Mountain', but I only read it after it was published as I was not given the full manuscript when I created the illustrations. Tough one. In terms of intricacy it wouldn't be one but the interconnected series 'The Fabled Lands' which attempted to offer more than 'find yourself in the typical maze or dilemma scenario' that tended to permute the early gamebook format. Where I worked in the 80's some of my students found out about my involvement with 'Warlock' and wanted to start a game club after school based round 'Runequest'. I was roped in, but it quickly fell by the wayside as too few, then virtually none [lol], turned up. 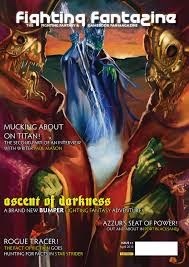 I often read the 'White Dwarf' scenarios but it was not till I went to France that I met any true gamers who wanted to involve me, and Frankly after being 'killed' so many times playing 'Warlock' I became rather disillusioned. lol. That depends a lot, I think, on what you like as a general thematic choice, and whether you wish to play alone or with with others. In general terms I would say 'The Fighting Fantasy' series, 'The Lone Wolf' series, and of course, 'The Fabled Lands' series. But I am no expert. Duh! The gamebook has been superseded by Game consoles, and downloadable apps that have moved far beyond the tiny game boxes that came out in the 1980's. The gamebook in its original state is more to do with nostalgia, especially in the UK , but is alive and vigorously kicking on the continent and the US. Its 'vinyl to the downloadable album from the web'. 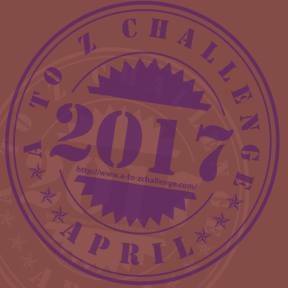 What is the process for creating illustrations for gamebooks? depends what you mean by 'process'. But effectively my usual working pattern goes as follows: being given a brief which involves a page of text or character/scene description, thinking about visual possibilities, trying out sketch ideas, pencilling, inking, cleaning, spotting & checking, sending sample for acceptance, making changes if required, sending artwork and invoice. What's the most important thing when coming up with gamebook illustrations? That the job is suitable and ideas are forthcoming. Is there anything that you enjoy illustrating more than anything else? Any particular creatures or scenes? No, I love any visual opportunities to create all elements relating to the world of Fantasy. But if you look at my work you'll always see a love of pattern and intricacy. What is your favourite piece of art? My interest in art is universal and encompasses every aspect ... my favourite piece of art is legion and ranges from fine through commercial to craft. How do you practice your drawing to make it the best it can be? As any artist, that is: I look, I synthesise, I imagine, I practice. At present I am working on a couple of projects in America and France where gaming, including Germany and Belgium and other parts of the continent, remains very active. Do you have any other sites besides your blogs/Twitter feeds? Blog, Facebook, Google+, etc. But have real need to organise a better website. The market has shrunk but remains very active in Europe, America and Canada particularly. I think as long as their are dedicate fans willing to make the time and effort they will live on, and at present the world of apps, and their possibilities, present a still developing field. For more examples of Russ's excellent work, visit his blog, his google+ and his Facebook. 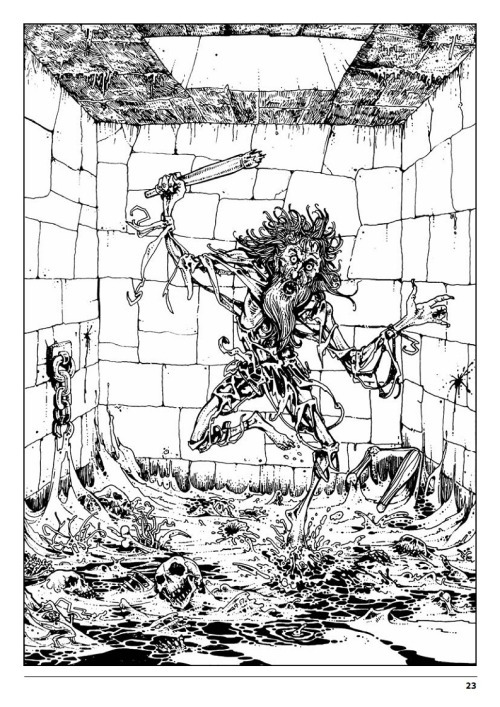 Since all my old Fighting Fantasy and Lone Wolf books have been boxed away for many years, the one nice thing about the Kindle editions have been seeing all that great artwork that I remember so well. Good Stuff. Thanks for the reply Jerry. Yes, digital media is seeing a rebirth of gamebooks. Thanks for the comment, Dave! Wanting someone to do your art when they are halfway across the world is one shining endorsement. Can I ask about where the fantastic Holmgard siege picture comes from? And is it actually one of Russ's? It does rather remind me of Gary Chalk. You are right Robin, that was my mistake - Gary Chalk did do that illustration. Great picture though, thanks for sharing! great interview! and i love all the illustrations. Wonderful. I've been hooked on Russ's illustrations since I was a boy. I used to obsessively scrutinise the pictures in 'City of Thieves' until I could almost see people waving back to me out of the windows. 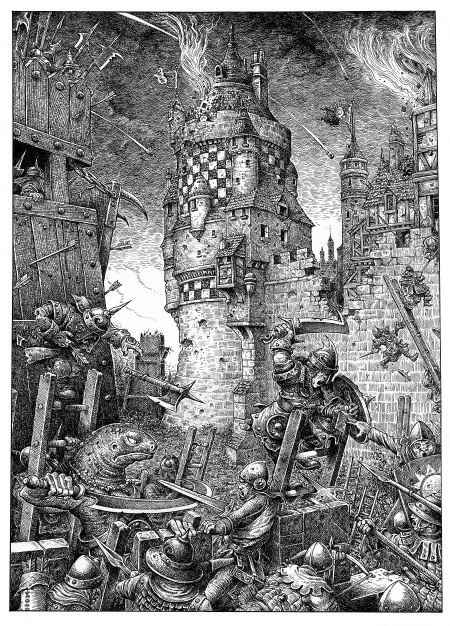 Sorry to be a fusspot, but the illustrations in 'City of Thieves' were by Iain McCaig. But yeah, I'm very fond of that book too.